Does Donald Trump Care about Puerto Ricans Affected by Hurricane Maria? Hurricane Maria made landfall in Puerto Rico’s southeast coast on September 20, 2017. Despite all the ups and downs associated with the island’s slow recovery after the storm, one thing seems to pretty steady. President Donald Trump and his White House have been arduously working to make sure that Hurricane Maria does not become the President’s Katrina. Many experts believe that the Bush administration’s poor response to Hurricane Katrina’s destruction of New Orleans and communities along Louisiana’s and Mississippi’s coast hurt President George W. Bush’s approval ratings and undermined his leadership on domestic issues. Other tweets followed, reassuring Americans that FEMA and first-responders “are supplied and ready” and asking those people in the path of the storm to “follow local evacuation orders”. President Trump’s views on Puerto Rico’s recovery after Hurricane Maria set off a media storm. Rather than ignoring the criticisms, he doubled his efforts. In one of his tweets, he cited Fox Business News Lou Dobb’s view that: “The people of Puerto Rico have one of the most corrupt governments in our country”, alleging that the island’s slow recovery rested in the hands of the local government. He then had the audacity to question the validity of a new study conducted by George Washington University on behalf of the Government of Puerto Rico that estimates the death-toll associated with Hurricane Maria was close to 3,000 lives. What do Americans think of President Trump’s response to Hurricane Maria? Do they think that he cares for to needs of the victims of this Category 4 storm? The recent Economist/YouGov poll (September 16-18, 2018) can help us answers these two questions. It is worth noting that this polling firm has asked the same questions three times since Hurricane Maria struck Puerto Rico, helping us understand whether American public opinion has shifted in this time period. These questions were first asked on October 1-3, 2017 as President Trump visited Puerto Rico and the U.S. Virgin Islands to survey the hurricane’s damages. The questions were fielded again on June 3-5, 2017 after the publication of a study in the New England Journal of Medicine that questioned the Government of Puerto Rico’s mortality data following Hurricane Maria and estimated that hurricane-related deaths stood between 793 and 8,498. Let’s look at respondents’ answers to the first question. 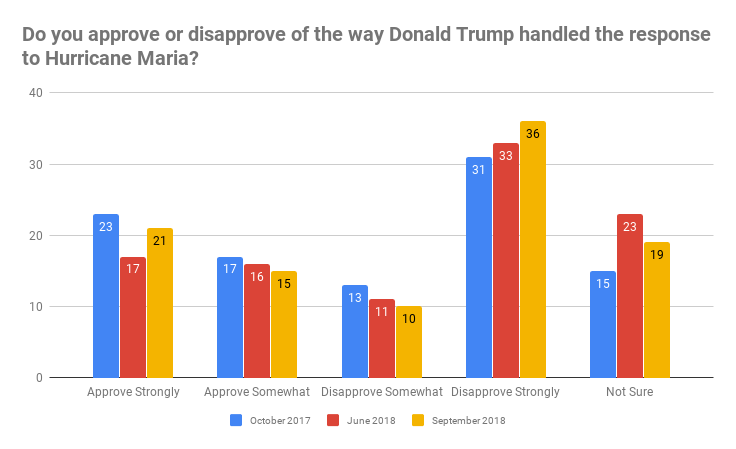 It seems that Americans are slightly more critical of the president’s handling of Hurricane Maria. Have his tweets hurt his political standing among his supporters or independent voters? It is worth noting that President Trump did not address Puerto Rico’s slow recovery or the controversy regarding the Puerto Rico Government’s inability to account for all the hurricane-related deaths. This could explain why his political standing with his supporters may have declined in early June 2018. The important finding is that his base thinks that his response to Hurricane Maria was the right one. 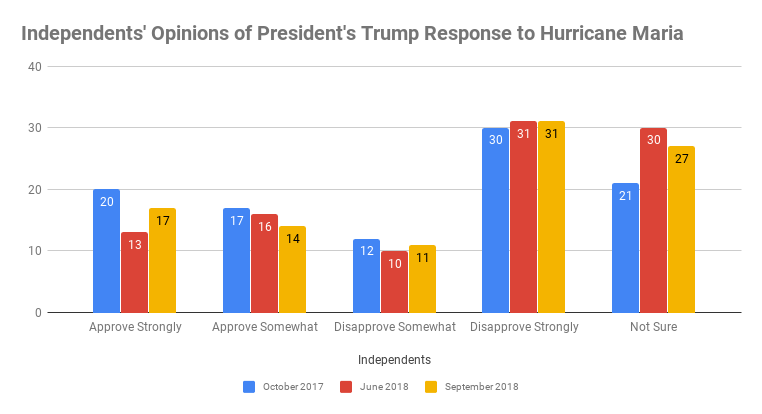 Given that the midterm elections are around the corner, it is important to considering whether independents approve or disapprove of the president’s response to Hurricane Maria. 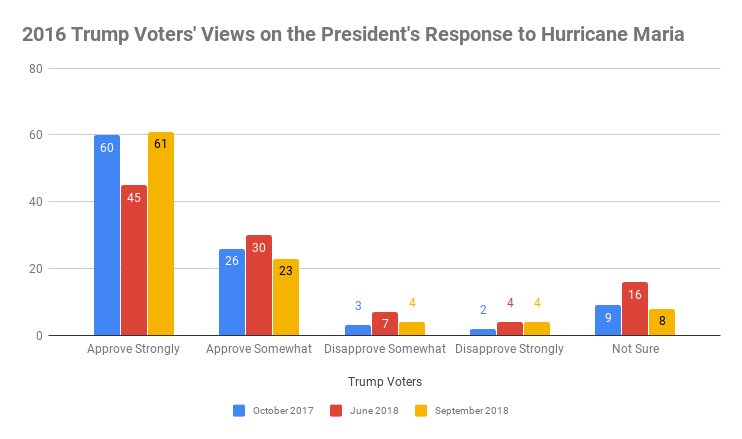 While independents are more critical today of President Trump’s response to Hurricane Maria, it is worth emphasizing that his standing has slightly improved with this voting group since June. Needless to say, the president’s strongest critics identify as Democrats. In October 2017, 54% of Democrats disapproved of his handling of the situation increasing to 73% today. 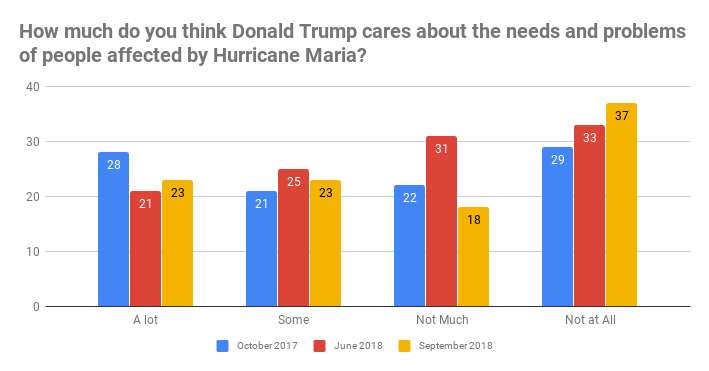 The Economist/YouGov Poll also asked respondents the following question: “How much do you think Donald Trump cares about the needs and problems of people affected by Hurricane Maria?” This question, as I noted in a previous post, is basically asking respondents to look past policy issues and to judge his moral character and his empathy towards others. 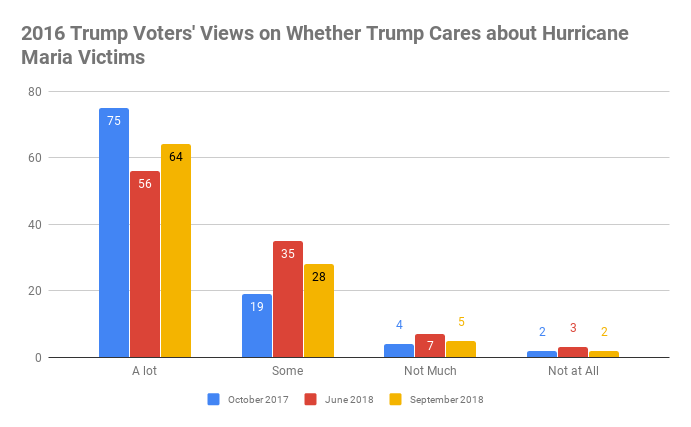 It is clear that while 46% of Americans approve of his handling of Hurricane Maria, many question his empathy towards the victims of the storm. This is even true among his strongest supporters. 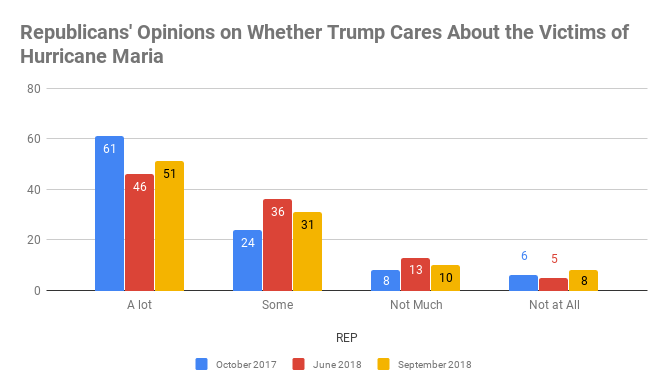 Today 6 in 10 Democrats believe he does not care “about the needs and problems of people affected by Hurricane Maria”, while 37% of independents feel the same way. Could these attitudes affect President Trump’s job approval? It is difficult to say. So far, it seems that while Trump’s supporters have problems with his moral character, they are not ready to abandon him at this point. We even see this attitudes with some members of Puerto Rico’s New Progressive Party (NPP), which currently controls Puerto Rico’s governorship and the legislature. While many Puerto Ricans were angered by Trump’s tweets, many of the NPP leaders, who identify as Republicans, publicly defended the president’s response. So far, it is difficult to say whether or not Americans believe that Hurricane Maria is Trump’s Katrina or whether the island’s slow recovery will hurt his future electoral prospects.What is clear is that many Americans still support Trump, though many do question his character. While this may seem strange, it is important to remember that as electoral races across the country start to intensify, the American public will become more polarized. Thus, we should expect that Trump’s support among Republicans and among his more ardent supporters to grow, regardless of how they feel about his moral deficiencies. NOTE: In the next weeks, the Puerto Rico Data Lab will be transition to this new site. For now, I will be publishing the same post in both platforms.